In the 1930s, the discovery of the ancient city of Lachish in the British Mandate of Palestine coincided with modern technological advancements which allowed archaeologists to share their breakthroughs with the world. In February 1939 a crowded lecture theatre assembled at Reading University. Members of the Berkshire Archaeological Society had gathered to watch Lachish – City of Judah, a documentary film produced to showcase the recent work of a team of British archaeologists at a mound called Tell ed-Duweir, near the small village of Quibibeh, which sat along a dirt road west from Hebron in what is now Israel. Locating biblical Lachish – an important city in the Kingdom of Judah mentioned frequently in the Hebrew Bible – was a long established aim of scholars who wanted to find, excavate and map the cities mentioned in the Bible and other ancient texts. The Palestine Exploration Fund (PEF) had been established in London in 1865 partly for this purpose. In 1890 the PEF’s committee funded the then-freelance archaeologist William Matthew Flinders Petrie to travel to Palestine, where he would excavate a tell – an artificial mound formed over hundreds or thousands of years from the accumulated refuse of people living on the same site – east of Gaza called Tell Hesy, which was thought at the time to be the site of Lachish. At the end of the excavation Season in 1890, Petrie was confident that Hesy was Lachish, but the site’s location continued to be debated. Then, in the 1930s, another team, composed of Petrie’s former students, uncovered compelling evidence suggesting that Lachish was in fact a different site near Hesy: Tell ed-Duweir. Rather than recording their excavation with still photography alone, the Tell ed-Duweir team embraced the new medium of film to share the significance of their finds with audiences in Britain – like the one gathered in a dimmed lecture theatre at Reading University. By the end of 1917, British troops of the Egypt Expeditionary Force under General Edmund Allenby marched into the Ottoman city of Jerusalem and established a military occupation in Palestine. After the First World War this became a civil occupation and in 1921 a League of Nations mandatory agreement gave Britain control over the region. A government structure was set up with a British High Commissioner and British-led civil service. Among the departments created was a Department of Antiquities. The mandatory government in Palestine was keen to attract archaeological teams to excavate sites – and tourists to visit them and spend money locally. By 1923, the Colonial Office in London oversaw British administration in Palestine and so, when the large-scale British Empire Exhibition was organised at the newly built Wembley Stadium in 1924 and 1925, a Palestine Pavilion showcased Palestinian ‘products’, including archaeology. There was already substantial media interest in the archaeological discoveries in Palestine. Archaeological finds had long been a regular feature in newspapers and illustrated magazines and the Daily Telegraph had funded an excavation at the Hill of Ophel in 1922. But the Wembley exhibition helped boost public enthusiasm. In the early 1920s the popular Illustrated London News featured a series of articles called ‘Digging Sacred Soil’, written by the Director of the Palestine Antiquities Department, John Garstang, a seasoned excavator best known for his pre-war work in Egypt, Sudan and Asia Minor. In each installment Garstang helped readers understand the wealth of archaeology lying under the surface of the far away land where in ancient times biblical characters – then more recognisable to the public than they might be today – were thought to have lived. During the 1920s and early 1930s a growing number of international teams began excavating sites in Palestine, many of them notable biblical cities: Megiddo, Shiloh and Ashkelon. In 1926, Petrie, who had spent nearly 50 years excavating in Egypt, returned to Palestine to start a new series of excavations. Petrie was looking for ancient Egyptian connections in sites in the southern part of Palestine, around Gaza. He and his wife Hilda brought with them several students as part of the Petries’ British School of Egyptian Archaeology. Among these students were three who would become very familiar with biblical Lachish: James Leslie Starkey, Olga Tufnell and Gerald Lankester Harding. In autumn 1932, Starkey, Tufnell and Harding left (or, perhaps, their archives suggest, escaped) the Petries’ fold. They found their own patrons and established themselves at Tell ed-Duweir, which Starkey had identified as a potentially fruitful site. Their initial funding was from a group of wealthy men: the American Henry Dunscombe Colt, British bicycle heir Charles Marston and Anglo-American pharmaceutical magnate Henry Wellcome. Colt and his wife Theresa ‘Terry’ Colt took part in the excavations, building themselves a large, comfortably furnished bungalow on the site. The rest of the party, including Harding, Tufnell, architect Ralph ‘Baa’ Richmond Brown and architect Herbert Hastings ‘Mac’ Macwilliams lived in tents. Archaeological Seasons run from winter to spring. In the first Season, from 1932 to 1933, several key finds were made at Tell ed-Duweir. 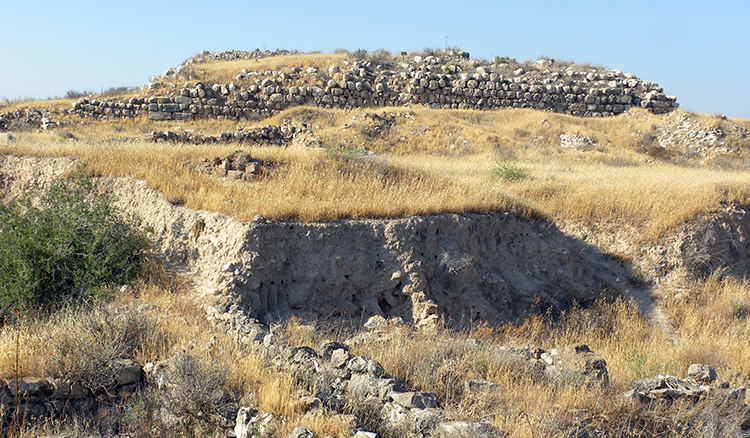 Ancient tombs with human remains, partially burnt, helped to strengthen the likelihood that Duweir was indeed Lachish, which ancient sources indicate had been under siege several times. One of the armies said to have laid siege to Lachish was Assyrian; among the objects discovered were pieces of iron ‘mail’ and a bronze helmet plume, in the Assyrian style. A bas-relief showing the siege at Lachish held in the British Museum, excavated from the Assyrian city of Nineveh, was used for a positive comparison. Biblical references to the siege provided further evidence. The Season’s work was reported in newspapers in Britain. One story recounts how a particularly skilled worker, a Sudanese girl called Salome, dug nearly 50 feet down to discover an ancient well, still containing usable water. At the end of the Season the archaeological team departed for Europe. Terry Colt hatched a plan to drive a souped-up lorry – christened ‘The Diabolical Strength’ – and drive it overland through Syria, Turkey, the Balkans and continental Europe. Three other members of the team signed on for the ride. Two travelogues recounting the events of the journey were published the following year. The description of the route and luggage taken on the trip in HH Macwilliams' travelogue, The Diabolical, is the first hint that the group were embracing the medium of film: a ‘Movie Camera’ was listed in under Appendix 4, ‘Etceteras’. In the long established tradition of overseas excavations, the team arranged an exhibition during the summer Season in London. Complementing the artefacts on display were Macwilliams’ dramatic reconstruction drawing of biblical Lachish and a model of the site. The team also attempted to situate the ancient past within its modern context by showing photographs of Bedouins employed to dig at Duweir as well as the textiles that they produce. Even the children employed were given space – their drawings, some of which show the skeletons uncovered – were mentioned in several reviews of the exhibition. In its second Season at Lachish, the excavation was formally named the ‘Wellcome Archaeological Research Expedition to the Near East’. Evidence of ancient Egyptian links with the site was uncovered – jewellery dated to the reign of Amenhotep III (c.1391-53 BC) the father of Pharaoh Akhenaten who had moved the Egyptian capital north from Thebes to Amarna in an attempt to establish his own monotheistic religion. Further Egyptian discoveries were made when a temple in the ‘fosse’ – the ditch or trench surrounding the Tell – was excavated. Another key find was the ‘Tell Duweir ewer’, a vessel with inscriptions thought to be in an early alphabetic script, a prototype of the modern alphabet. Yet while the excavation was primarily about discovering the ancient past, modern communication technology was key. The installation of a field telephone on site ensured the team could share news of their findings as quickly as possible, drumming up enthusiasm for their work. When the exhibition of the Season’s finds was opened in London, artefacts were dramatically presented using full-size casts. In Februrary 1935, the Palestine Post announced that, during the third Season at Duweir, a set of pottery sherds inscribed in ancient Hebrew have been uncovered. Charles Marston later described it as, ‘the most important archaeological discovery of the present century’. Among the inscriptions were copies of correspondence that were initially reported to be from an official at Lachish to an official in Jerusalem, making the claim that Duweir is Lachish almost irrefutable. Marston, an evangelical Christian, had in 1934 published The Bible is True! on the role of archaeology in proving biblical texts. He was so convinced of the importance of the discovery, and its biblical links, that he secured all rights of publication, proposing to give them to the press and broadcasting companies free of charge. Field reports sent regularly to Henry Wellcome in London indicated that ‘Baa’ Brown had been filming the excavations for publicity purposes. When the expedition team returned in spring 1935, the exhibition of the Season’s discoveries, previously held at the Palestine Exploration Fund, was arranged at Henry Wellcome’s Research Institution, now the Wellcome Collection, on Euston Road. The Lachish letters were put on display there as well as a dramatically lit cast of the British Museum’s Lachish relief, coloured to give full effect. To complement the display, a ‘cinematograph film’ of the excavations, juxtaposing ancient and modern, was shown twice a day. It was a version of this film that was screened at Reading University in February 1939. 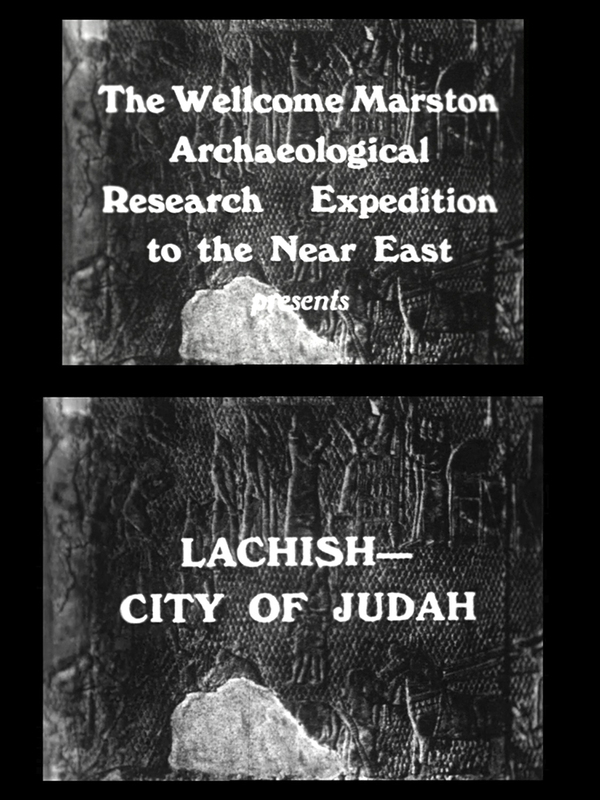 In 2016 a canister of 16mm film containing a version of Lachish – City of Judah was itself excavated from the archive at the Institute of Archaeology, University College London. Under the auspices of the Filming Antiquity project, this film has been newly digitised, enabling contemporary researchers – and, eventually, the wider public – to enjoy once more the story of the Duweir dig as its excavators wanted it to be told. Clip from Lachish – City of Judah showing conservation on site at Duweir. Courtesy of the UCL Institute of Archaeology. The film is fragmentary. There are hanging intertitles with no linking image sequences, and records indicate that footage was shot over consecutive Seasons. Like the drafts of a manuscript, the newly digitised version of Lachish – City of Judah should be considered a work-in-progress. Film was a relatively flexible medium of communication for the excavators; footage could be added or spliced together to create a cohesive film. A film of the Lachish excavations was shown in conjunction with the 1937 and 1938 exhibitions, so it seems likely that these were different manifestations of a film with the overarching title Lachish – City of Judah. It was important – not least to the expedition’s funder Charles Marston – that Duweir/Lachish’s biblical links were presented. In 1937 Marston published The Bible Comes Alive, his history of the Duweir excavations and their significance. Because of this, the film’s introduction is unambiguous about the biblical significance of Lachish. Rolling script shot over a hand turning the pages of a Bible includes extracts from the Books of Joshua, Second Chronicles and Jeremiah that reference Lachish. But the physical evidence of biblical Lachish is only one aspect of the film. As in the exhibitions, the dig is situated in its modern context, showing the scientific processes of archaeology. 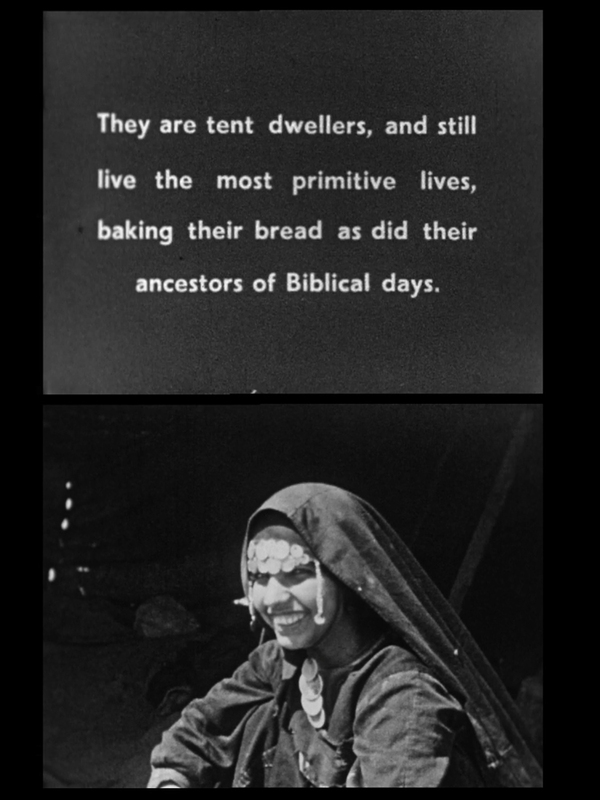 Footage showing Bedouin tents and the Quibibeh village accompany an intertitle on local recruitment to the excavations (though these communities are, Western viewers are assured, the same as in biblical times). Excavation technology is emphasised; one intertitle states that ‘even archaeologists are mechanised’, with footage showcasing engineering feats on site: tall cranes and an extensive system of railway tracks to facilitate dumping earth. Both the diggers and archaeologists demonstrate the process of excavation and conservation – one sequence shows a kaffiyeh-clad man carefully blowing soil off a scarab he is removing from the ground, while in another an unidentified woman in sunglasses pours boiling wax on an animal skeleton to preserve it. 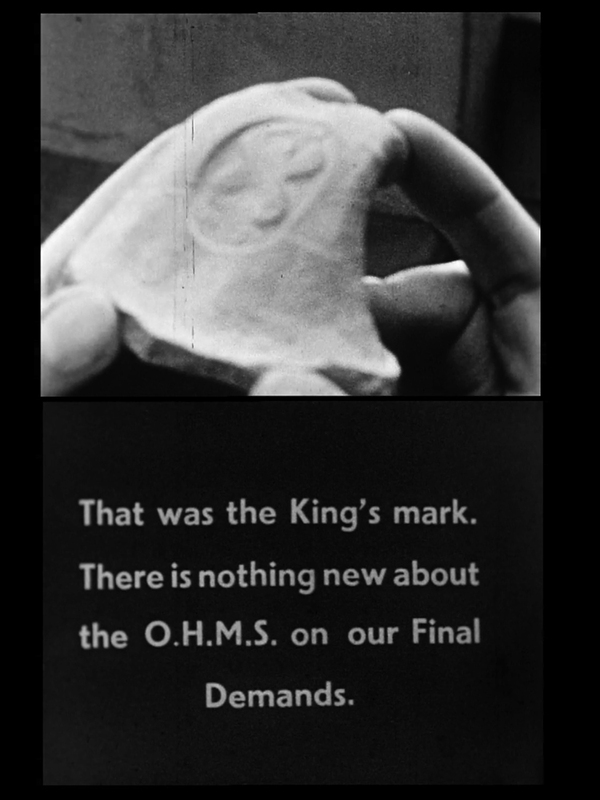 The film’s intertitles demonstrate a commitment to present the finds in a way non-specialist audiences would be able to understand: a seal on a vessel handle is presented as evidence of taxation with the accompanying intertitle referencing modern tax correspondence. The Lachish film is not unusual for this period. Archaeological excavations were captured in newsreel footage, but archaeological teams from both Britain and the US were also using moving image technology to capture the process of excavation for public audiences. The Egypt Exploration Society had shown footage of their excavations at Tell el Amarna, Akhenaten’s capital city, in conjunction with their London exhibition of artefacts from the site in 1931. The Metropolitan Museum of Art added Digging up the Past, showing Met excavations in Egypt, to its list of rentable educational films the same year. Embracing the absolute latest in sound technology, the archaeologist Charles Breasted (whose father James had founded the Oriental Institute of Chicago in 1919) created an archaeological ‘talkie’, The Human Adventure, in the early 1930s for release to universities. Filmed over several Seasons, The Human Adventure documents an aerial journey across the Middle East to Persepolis in Iran with stops at key excavations, including biblical Megiddo, en route. The lifetime of man is short, and even the greatest of his works live for a few centuries at most. Time and its allies, the wind and the dust, quickly cover them. Amara Thornton is an Honorary Research Associate at the Institute of Archaeology, University College London and Principal Investigator of the Filming Antiquity project.